In Burkina Faso, malaria remains the overall leading cause of morbidity and mortality accounting for 35.12% of consultations, 40.83% of hospitalizations and 37.5% of deaths. Genotyping of malaria parasite populations remains an important tool to determine the types and number of parasite clones in an infection. The present study aimed to evaluate the merozoite surface protein 1 (msp1) and merozoite surface protein 2 (msp2) genetic diversity and allele frequencies in Bobo-Dioulasso, Burkina Faso. Dried blood spots (DBS) were collected at baseline from patients with uncomplicated malaria in urban health centers in Bobo-Dioulasso. Parasite DNA was extracted using chelex-100 and species were identified using nested PCR. Plamodium falciparum msp1 and msp2 genes were amplified by nested polymerase chain reaction (PCR) and PCR products were analyzed by electrophoresis on a 2.5% agarose gel. Alleles were categorized according to their molecular weight. A total of 228 blood samples were analyzed out of which 227 (99.9%) were confirmed as P. falciparum-positive and one sample classified as mixed infection for P. malaria and P. falciparum. In msp1, the K1 allelic family was predominant with 77.4% (162/209) followed respectively by the MAD20 allelic family with 41.3% and R033 allelic family with 36%. In msp2, the 3D7 allelic family was the most frequently detected with 93.1 % compared to FC27 with 41.3%. Twenty-one different alleles were observed in msp1 with 9 alleles for K1, 8 alleles for MAD20 and 4 alleles for R033. In msp2, 25 individual alleles were detected with 10 alleles for FC27 and 15 alleles for 3D7. The mean multiplicity of falciparum infection was 1.95 with respectively 1.8 (1.76–1.83) and 2.1 (2.03–2.16) for msp1 and msp2 (P = 0.01). Our study showed high genetic diversity and allelic frequencies of msp1 and msp2 in Plasmodium falciparum isolates from symptomatic malaria patients in Bobo-Dioulasso. Despite substantial efforts to eliminate or control malaria, it remains the leading cause of morbidity and mortality in the world . In Burkina Faso, malaria is responsible of 35.12% of consultations, 40.83% of hospitalizations and 37.5% of deaths. Since 2005, several efforts have been made in the country to reduce the burden of malaria including provision of artemisinin-based combinations treatments (ACTs), distribution of long-lasting insecticidal nets (LLINs) and scale-up of seasonal malaria chemoprevention with amodiaquine-sulfadoxine-pyrimethamine (AQ-SP) in children aged 6–59 months. However, in 2015, the Burkinabe health facilities recorded 7,836,411 malaria cases, including 450,042 cases of severe malaria and 5379 deaths . Genotyping of malaria parasite populations remains an important tool to determine the types and number of parasite clones in an infection. In molecular epidemiological studies of malaria, this approach is used to investigate the genetic diversity of infections with consideration of various factors including transmission intensity and host immunity. The most widely used techniques for genotyping malaria infections are based on amplification by PCR of the polymorphic genes encoding the merozoite surface proteins 1 and 2 (MSP1 and MSP2) and the glutamate-rich protein (GLURP) [3–9]. MSP 1 and MSP2 are two major Plasmodium falciparum blood-stage malaria vaccine targets  playing important role in identification of genetically distinct P. falciparum parasite sub-populations . They are involved in erythrocyte invasion  and are targeted by the immune responses [13, 14]. MSP1 is a 190 KDa surface protein encoded by the msp1 gene located on chromosome 9 and contains 17 blocks of sequences flanked by conserved regions [15, 16]. Block 2, which is the most polymorphic part of MSP1, is grouped into three allelic families namely K1, MDA20 and R033 . MSP2 is a glycoprotein encoded by the msp2 gene located on chromosome 2 and composed by five blocks of which the central block is the most polymorphic . The msp2 alleles are grouped into two allelic families, FC27 and 3D7/IC1 . Both msp1 and msp2 have been shown to be highly polymorphic in different geographical settings in malaria endemic countries [3, 7, 19, 20]. In areas with intense malaria transmission, the probability of new infection with the same parasite genotype in a subject is very low . The diversity of the P. falciparum genome enables the comparison of the genotypes of isolates collected before the treatment and at the time of recurrent malaria infection. This comparison has been widely used to classify treatment outcomes in antimalarial clinical trials [22, 23]. To our knowledge, there is very limited information on msp1 and msp2 genetic diversity in Bobo-Dioulasso. The present study aimed to evaluate the genetic diversity and allele frequencies of msp1 and msp2 in malaria parasites isolated from symptomatic patients in Bobo-Dioulasso, Burkina Faso. Samples for this study were provided by a clinical trial conducted from October to December 2012 in two health facilities of Colsama and Sakaby in the district of Do in Bobo-Dioulasso, located in the western region of Burkina Faso. Malaria transmission is holoendemic with a peak around August to October and an estimated entomological inoculation rate (EIR) of 300–500 infective bites per person per year. In 2012, the population of the health district of Do was estimated to be about 504,895 inhabitants . All subjects aged 6 months or more and attending Colsama and Sakaby health centers with fever or history of fever in the last 24 h were referred by a clinician for screening of malaria infection using Giemsa-stained thick and thin blood smears. Participants with Plasmodium spp. infection at parasite densities between 2000 and 200,000 parasites/μl and hemoglobin > 5g/dl were included in the clinical study after they or their parents/guardians had signed an informed consent form. Other inclusion criteria were: absence of known adverse events to study drugs, absence of non-malarial febrile diseases, absence of documented malaria treatment in the two weeks prior to enrolment, absence of danger signs or severe malaria. Details of the overall clinical study have been described elsewhere . For all patients included in the clinical study, blood was also collected on filter papers (Whatman 3 mm, GE Healthcare, Pittsburg, USA) at any scheduled or unscheduled visit, labeled, air-dried and stored into sealed plastic bags at ambient temperature. Parasite DNA was subsequently extracted from day 0 samples using the QIAamp DNA Mini Kit (Qiagen, Hilden, Germany) according to the Qiagen-DNA purification from dried blood spot protocol. Plasmodium species were detected using a modified protocol from Snounou et al. . Briefly, species were analyzed/determined by amplification of 18S ribosomal RNA using nested PCR with secondary primers specific to the species Plasmodium falciparum, Plasmodium malariae, Plasmodium ovale and Plasmodium vivax. Primary and nested PCR primer sets used are listed in Table 1. Separate reactions were performed for each set of nested primers. For quality control, a template-free control was used in all reactions and genomic DNA from laboratory strains was used as a positive control for respective species. Both primary and secondary PCRs were carried out in a final volume of 25 μl containing 16.05 μl of sterile water, 0.5 μl of each primer (www.eurogentec.com), 2.5 μl of 10× PCR buffer, 2.5 μl of each dNTP, 1.5 μl of 25 mM MgCl2, 0.2 μl of Go Taq DNA polymerase (www.promega.com) and 2 μl of Template DNA or primary PCR product. All PCRs were performed in a BIO-RAD S1000 thermal cycler (Bio-Rad, California, USA) under the following conditions for primary (35 cycles) and secondary PCR (30 cycles): initial denaturation at 94 °C for 1 min, extension at 94 °C for 1 min, 58 °C for 2 min and 72 °C for 5 min, and final elongation at 72 °C for 5 min. The msp1 and msp2 of all Plasmodium falciparum parasites were amplified using sequence-specific primers according to a modified protocol previously described . In summary, the primary reaction used a set of primers corresponding to the conserved regions of block 2 for msp1 and block 3 for msp2. The second reaction primer set targets specific allelic families of msp1 (MAD20, K1 and R033) or msp2 (IC/3D7 and FC27). Reactions for each set of primary and nested primers were performed separately. A template-free control was used in all reactions and genomic DNA from cloned laboratory strains was used as a positive control for respective alleles. Cycling conditions for both msp1 and msp2 as well as primer sequences are summarized in Table 2. All PCR products were analyzed by electrophoresis on a 2.5% agarose gel. DNA fragments were stained with ethidium bromide and visualized by UV trans-illumination. The sizes of the amplicons were detected using a 100 bp DNA ladder (Promega, Madison, USA). Plasmodium species were identified by comparison of DNA fragments from the samples with DNA fragments from known positive controls (www.beiresource.org). Alleles of msp1 and msp2 were categorized according to their molecular weights. MOIs were calculated by dividing the total number of distinct msp1 and msp2 genotypes by the number of positive samples for each marker. The mean MOI was calculated by dividing the total number of alleles detected in both msp1 and msp2 by the total number of positive samples for both markers. Samples were considered single infected when harboring only one allele at each of the genotyped loci. Multiclonal infections were defined as infections with more than one allele in at least one locus. Data were collected with Epidata and analyzed by R version 3.4.0 (2017-04-21). The allelic frequency of msp1 and msp2 was calculated as the proportion of the allele detected for each allelic family out of the total of alleles detected. The frequency of polyclonal infection was calculated using number of samples with more than one amplified fragment out of the total samples. The mean MOI was determined by dividing the total number of alleles detected in both msp1 and msp2 by the total number of positive samples for both markers. The Chi-square test was used to compare proportions. Statistical significance was defined as P < 0.05. Overall, 441 subjects were screened for malaria infection out of which 244 subjects were included in the clinical study. Sixteen subjects were excluded (withdraw of consent, protocol violation, loss of follow-up) and the remaining 228 subjects completed the study follow-up. Details on baseline characteristics of the study population will be published elsewhere. Briefly, the study included 110 male and 118 female subjects. The mean age was 9.8 years (± 0.6) with minimum and maximum ages of 0.6 and 60 years, respectively. The mean body axillary temperature measured prior to blood sampling was 38.51 °C (± 1.1) and the mean parasite count was 52,543 parasites (46,385.36–58,700.89) per μl of blood. All 228 blood samples analyzed were confirmed as P. falciparum-positive by nested-PCR. Only one sample was classified as a mixed infection for P. malariae and P. falciparum. Plasmodium ovale and P. vivax were not detected in the samples. Out of 228 baseline samples analyzed, 209 were successfully amplified for msp1 (91.67%) and 188 (82.8%) for msp2. In msp1, the K1 allelic family was predominant with 77.4% (162/209), followed by the MAD20 allelic family with 41.3% (86/209) and the R033 allelic family with 36% (75/209). Thirty-eight percent (38.1%) of the samples positive for msp1 were classified as monoclonal infection and the remaining 61.9% were classified as polyclonal infections with K1/MAD20, K1/R033 and MAD20/R033 representing 21.5, 22.3 and 11.3%, respectively. Only 6.9% of samples harbored together the K1, MAD20 and R033 allelic families (Table 3). In msp2, the 3D7 allelic family was the most frequently detected with 88.2% (176/188) compared to FC27 with 52.9%. Allelic distributions of both msp1 and msp2 did not differ significantly when the study population was subdivided by age group (Table 4). About one-third (34.4%) of samples were classified as polyclonal infection and two-thirds classified as monoclonal infection for msp2 (Table 5). For both msp1 and msp2, alleles were classified according to the size of the amplified PCR fragment. Twenty-one different alleles were observed in msp1 with 9 alleles for K1 (fragment range 160–350 bp), 8 alleles for MAD20 (fragment range 150–300 bp) and for 4 alleles for R033 (fragment range 120–200 bp). In msp2, the K1 200 bp, 250 bp and 240 bp; the MAD20 200 bp and 220 bp; and the R033 150 bp were the most prevalent with a frequency above 20%. The allele distribution of msp1 is represented in Fig. 1a-c.
With regard to msp2, 25 individual alleles were detected with 10 alleles for FC27 (fragment range 250–550 bp) and 15 alleles for 3D7 (fragment range 100–450 bp). The frequency of all alleles detected in the 3D7 family was less than 20% while the allele with 400 bp (31%) was the most prevalent in the FC27 family. Allele distribution for both FC27 and 3D7 families is illustrated in Fig. 1d-e. In total, 61.9% (153/209) and 34.4% (65/188) of the isolates contained multiple infections in msp1 and msp2, respectively. The MOIs for both msp1 and msp2 are summarized in Table 5. MOI for msp2 was 2.1 (2.03–2.16) with a range of 1–6 strains, and was higher than MOI for msp1, i.e. 1.8 (1.76–1.83) with a range of 1–4 strains (P = 0.01). Plasmodium falciparum msp1 and msp2 are currently being recommended in antimalarial clinical trials as standard markers to distinguish recrudescent from newly infecting malaria parasites . However, to our knowledge, very few studies have investigated the genetic diversity of msp1 and msp2 in malaria parasites circulating in many endemic countries including Burkina Faso. Our study aimed to evaluate the genetic diversity and allelic frequency of msp1 and msp2 in malaria parasites isolated from symptomatic patients in Bobo-Dioulasso. Our study showed that the frequency of successfully genotyped samples for msp1 was higher than msp2. This result is consistent with previous studies in a rural area of Burkina Faso  and in Cote d’Ivoire and Gabon . K1 and 3D7 were the predominant families for msp1 and msp2 as also demonstrated in previous studies in Africa including Burkina Faso [28, 30], Cote d’Ivoire, Gabon  and Ethiopia , but in contrast to other studies in Sudan and Central Africa . These two allelic families might play important roles in clinical malaria at least in Bobo-Dioulasso. In our study, we did not examine the association between the dominant allelic families and the manifestation of the disease because all samples were collected from uncomplicated malaria patients. In previous studies, the dominance of K1 allelic family has been associated with severe malaria [32, 33] and also with asymptomatic malaria [34, 35]. Our study reported high genetic diversity with 21 and 25 genotypes for msp1 and msp2, respectively, in parasites circulating in the southwest of Burkina Faso. This finding is consistent with those from previous studies in different malaria endemic countries in Africa [28, 36, 37]. The high parasite genetic diversity may be related to the intensity of malaria transmission in Bobo-Dioulasso where 767,126 cases were recorded in 2015 . A number of studies have demonstrated that the majority of subsequent malaria episodes in this area are due to newly infecting parasites [38–40]. This high genetic diversity found in Bobo-Dioulasso might be associated with the high risk of being infected by multiple parasites haboring different genotypes. The genetic diversity reported could also be an effect of factors such as antimalarial pressure, the use of LLINs, insecticide indoor residual spraying and other factors as demonstrated in previous studies . Our study did not show any significant difference in MOI using msp1 and msp2 with nearly two alleles per locus for both markers. The overall MOI reported in this study is lower than that reported by Soulama et al. in parasites isolated from symptomatic children in Ouagadougou and Saponé, respectively located in the centre and centre-south of Burkina Faso . The difference in MOI can be explained by the differences in geographical areas, intensity of malaria transmission and other factors such as the difference in age of study population and mean parasite density in the study population [31, 36, 41]. In our study, we did not analyze MOI according to the age, intensity of transmission or parasite density but several studies reported conflicting results. Some studies have demonstrated that MOI correlates with ages, parasite density [41, 42] and intensity of malaria transmission  but others studies failed to demonstrate this correlation [44, 45]. The low MOI reported in our study can also be explained as an effect of malaria control measure such as the deployment of artemisinin-combination therapy , and the large-scale distribution of LLINs across the country. One limitation of this study is that the allelic frequencies and genetic diversity reported may have been estimated incorrectly due to the detection limit of the PCR technique used in the study. Alleles with short differences in length (less than 10 bp) might not be clearly distinguished as separate alleles on agarose gel and this could lead to a misclassification of the genotype. Our study showed high genetic diversity and allelic frequencies of msp1 and msp2 in Plasmodium falciparum isolates from uncomplicated malaria patients in Bobo-Dioulasso. K1 and 3D7 are the most prevalent allelic families. More than 50% of infections are classified as polyclonal infection for msp1 against one-third percent for msp2. 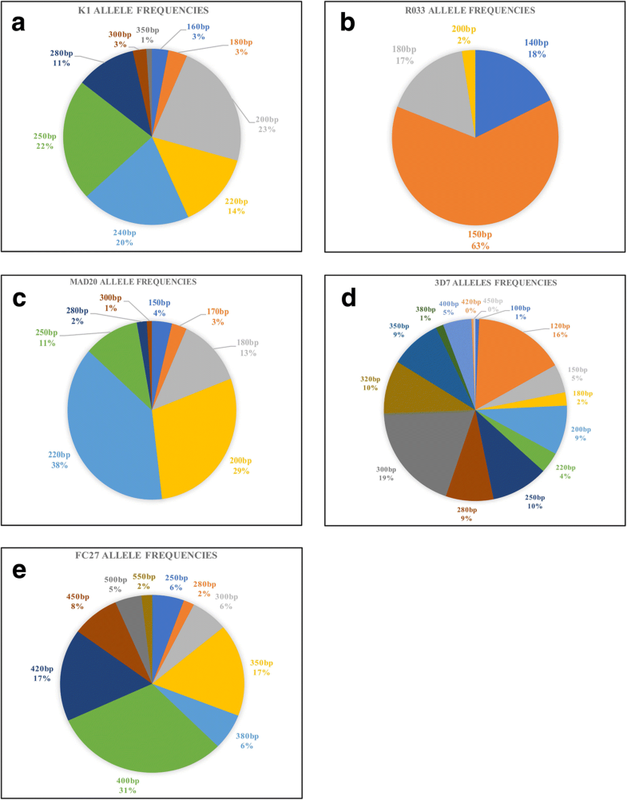 The high diversity reported may reinforce the use of msp1 and msp2 to distinguish recrudescent from new infection in antimalarial efficacy trials in Burkina Faso. However, further investigations with more powerful techniques such as capillary electrophoresis and DNA sequencing are needed to better characterize the malaria parasites in the country. We thank the study participants and their parents or guardians for their participation in the study. We also thank the clinical study teams and the health centers’ staff for their continued support. Many thanks are due to Bei Resource for providing controls DNA. This study was funded by the National Malaria Control Program of Burkina Faso. This study was supported by the Burkinabe National Malaria Control Program. JBO and IZ designed the study. AFS and YS monitored all laboratory activities. AFS provided technical advice for genotyping, data interpretation and wrote the first draft of the manuscript. FN was the clinician of the study. BT, CN and LKT performed all PCR and BT performed statistical analysis of the results. All authors read and approved the final manuscript. Participants of the clinical study provided written informed consent before their enrollment and the study was approved by the institutional ethic committee of Centre Muraz, Burkina Faso (Ref. A05-2012/CE-CM). All participants received adequate antimalarial treatment.